A few years ago the world of wine was alerted to the catastrophe about to befall the beautiful Greek island of Santorini. Tourism was triumphing over viticulture. Land that should be upholding the island's ancient vine-growing tradition was being sold off for hotels and villas. 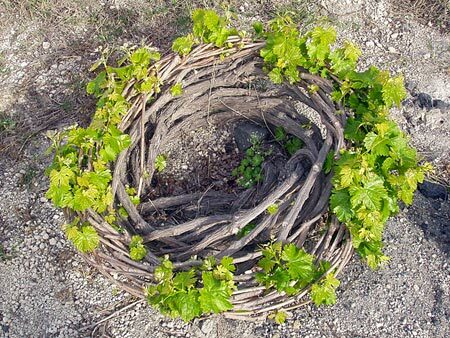 Mass-market tourism would soon wipe out the indigenous Assyrtiko vine almost as soon as it had demonstrated that it could produce world-class dry whites. Back from my first visit to the island, I am not so sure that Santorini's wine industry is in danger of collapse. Indeed it looked pretty vibrant to me. There were signs advertising wineries, winery visits and wine museums everywhere, and all the smartest hotels seemed to make much of their wine connections. It probably helped too that the vineyards are quite exceptionally green and healthy this year, thanks to an unusually wet winter and spring. Normally by July the vines are starting to yellow and dry out. Since vines are still by far the dominant crop on the island - even if considerably less than the 48,000 hectares (120,000 acres) or three-fifths of the entire island area that was devoted to supplying imperial Russia with sweet wine in the mid-19th century - this makes a huge difference. Keep in mind that in the article Vinsanto wine is reported as vissanto and there is a misunderstanding about the origin. Vinsanto name origin is "Vin Santorin", and it was exported from Santorini, not imported.